HONOLULU — As a mark of respect for Capt. Reid Kijiro Nishizuka, Gov. Neil Abercrombie ordered that the national flag and Hawaii state flag be flown at half-staff at all state offices and agencies as well as the Hawaii National Guard on May 11, the day of his memorial service. Born in Honolulu, Nishizuka, 30, graduated from Kailua High School in 2000 and earned an aerospace engineering degree from the University of Notre Dame in 2005. He entered military service in June 2005 and served as a pilot in the U.S. Air Force with 2,434 flying hours, more than half of that in combat. He completed multiple deployments in Iraq and Afghanistan, and received 10 Air Medals, two Air Force Commendation medals, and two Air Force Achievement Medals. 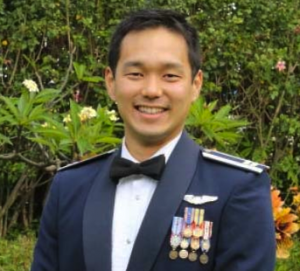 Nishizuka was serving with the 427th Reconnaissance Squadron, based at Beale Air Force Base in Northern California, when, on April 27, his MC-12 aircraft crashed near Kandahar Airfield, Afghanistan, and he was killed along with Capt. Brandon L. Cyr, 28, of Scott Air Force Base, Ill.; Staff Sgt. Daniel N. Fannin, 30, of Tinker Air Force Base, Okla.; and Staff Sgt. Richard A. Dickson, 24, also assigned to Beale Air Force Base. Nishizuka is survived by his father, Ricky; mother, Karyn Hatakeyama; stepfather, Dr. Deane Hatakeyama; stepmother, Norene; brothers, Chad and Reyn; stepsisters, Leinelle Baptista and Lyllis Manzano; and grandparents, Shizuichi and Masako, and Ruth Kushimaejo.